Компания "Bayerische Flugzeug-Werke" начала выпускать детали для самолетов в годы Первой мировой войны. После войны, сменив название на "BMW", фирма на долгие годы стала ведущим производителем автомобилей, мотоциклов и моторов для самолетов. В ДальшеMore>>> 1926 году в баварском Аугсбурге была образована новая компания "Bayerische Flugzeugwerke", главным конструктором которой стал дипломированый инженер Вилли Мессершмитт. Под его руководством были спроектированы самые ранние гражданские самолеты фирмы, из которых первым действительно удачным стал BFW M.18. К разработке этого самолета В. Мессершмитт приступил в 1925 году. Прототип был изготовлен в основном из дерева. Это был высокоплан с консольным крылом, фюзеляжем с плоскими бортами и традиционным хвостовым оперением. Необычными были выполнены основные опоры шасси, основные элементы которых находились внутри фюзеляжа - в результате просвет между поверхностью земли и фюзеляжем получился очень небольшим. Самолет, управляемый одним летчиком, мог перевозить трех пассажиров. На прототипе стоял звездообразный мотор Siemens-Halske Sh.11 мощностью 80 л. с.
По результатам испытаний прототипа приняли решение о постройке серийных машин, уже цельнометаллических, но частично с полотняной обшивкой. Первые две из них, с моторами Sh.11, обозначались как M.18a, и в 1926 году их передали компании "Nordbayerische Verkehrsflug". Эта компания, а также "Deutsche Verkehrsflug" успешно эксплуатировали 18 самолетов M.18 различных вариантов. Вариант M.18b (построено 12 машин) отличался от M.18a более мощным мотором Sh.12, экипаж самолета состоял из двух человек, и он мог брать на борт пять пассажиров. Самолеты варианта M.18c (построено два или три) оснащались моторами Armstrong Siddeley Lynx мощностью 220 л. с. Вариант M.18d (построено 8) представлял собой несколько увеличенный вариант с новым шасси, обеспечившим больший зазор между землей и фюзеляжем. На M.18d ставились различные моторы, включая Wright Whirlwind мощностью 220 л. с., Armstrong Siddeley и Walter Mars мощностью 150 л. с.
Силовая установка: один звездообразный мотор Siemens-Halske Sh.12 мощностью 112 л. с. Surely, one of the most economical small passenger machines ever produced must be the little Messerschmitt M. 18 built, and exhibited by the Bayerische Flugzeugwerke. Of all-metal construction, this little machine is designed to carry four passengers and one pilot with an engine of 100 h.p. only, or a power expenditure of only 20 h.p. per occupant! Not only so, but the range of this amazing little machine is given as 600 km. (373 miles). Whether this figure is merely an estimated one, or has been attained in practice, we do not know. The M.18 is not a new machine, but has been in use for some years, and thus the performance figures given at the end of these notes are probably reliable. It would certainly appear that the machine is entitled to a close examination, both on account of its economy in operation and because of its aerodynamic design. 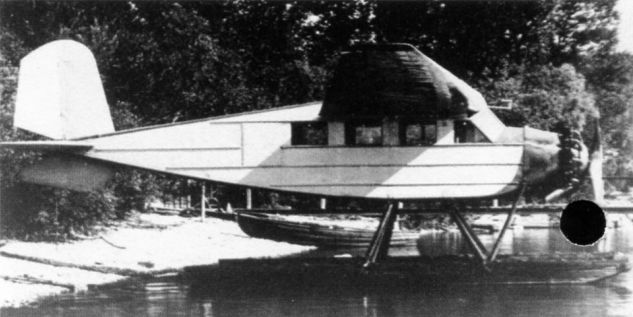 In our opinion, Herr Messerschmitt is one of the rising German designers, and his work now and in the future should be watched with interest by British designers, the more so as the small commercial machine is now being studied in this country with a view to meeting the requirements of the British Dominions. The M.18 attains its economy of operation partly by efficient aerodynamic design, resulting in a very small power requirement, and partly by clever construction which gives a most unusual ratio of weight carried to tare or empty weight. On the aerodynamic side it is seen that, to begin with, Herr Messerschmitt has chosen a fairly large span (15-6 m.) in order to keep down induced drag. As the span is 51-2 ft. and the total loaded weight is 2,640 lb., the ratio span^2/weight is nearly 1, a very high figure for a commercial machine. This the machine, the ratio of lift to induced drag is in the neighbourhood of 50. At 60 m.p.h., or somewhere in the region of the take-off speed, this ratio will still be as high as 30 or so, thus helping materially in enabling the machine to take off with a high load per horse-power. Great care in streamlining the nose of the machine, by cowling the engine, etc., has probably resulted in another reduction of drag, while the undercarriage has been kept of such an elementary form that its drag is probably also quite low, the axles springing straight out through slots in the sides of the fuselage, as shown in one of our sketches. The fuselage itself, although of the flat-sided variety, appears of reasonably good form, and altogether the minimum drag of the M.18 is probably extremely low. It is a little more difficult to discover how Herr Messerschmitt has managed to keep his structure weight down to a figure which will permit the load carried by the machine to be equal to the tare weight. The fuselage is built of former, and stringers of "open" sections to facilitate inspection of rivets, &c, and covered with flat Duralumin sheet. The monoplane wing shows the same type of single spar construction as the large M.20, the wing covering being Duralumin sheet over the front portion, and fabric near the trailing edge. The little cabin is quite comfortable, although naturally somewhat small, and the pilot's cockpit is well protected, while at the same time the view forward is quite good. Although designed primarily for passenger carrying, the M.18 can be used for a variety of other purposes. For instance two of the seats can be removed and the machine used for photographic work, a detachable plate in the floor making it possible to mount a camera there. The type M.18 has for some years been in service on the lines of the North Bavarian Flying Company of Furth, and is reported to have proved very satisfactory, being reliable and very economical in operation. The B.F.W. M.18 has an overall length of 8 m. (26-3 ft.), a wing span of 15-6 m. (51-2 ft.), and a wing area of 24-5 sq. m. (264 sq. ft.). The tare weight is 600 kg. (1,320 lb.) and the permissible load 600 kg., giving a total loaded weight of 1,200 kg. (2,640 lb.). The engine is a Siemens radial, type S.H.12, rated at 100 h.p. at normal revolutions. The power loading on this basis is thus 26-4 lb./h.p. and the wing loading 10 lb./sq. ft. The maximum speed is 140 km./h. (87 m.p.h.) and the cruising speed 130 km./h. (about 80 m.p.h.). The ceiling is 3,000 m.. (9, 840 ft.). The range (presumably at cruising speed) is 600 km. (373 miles). Самолет M.18a был одной из первых конструкций Вилли Мессершмитта. Он оснащался мотором Sh.11. The B.F.W. M.18 is a small "feeder line" type of monoplane of all-metal construction. Big and Little Brother: Two B.F.W. 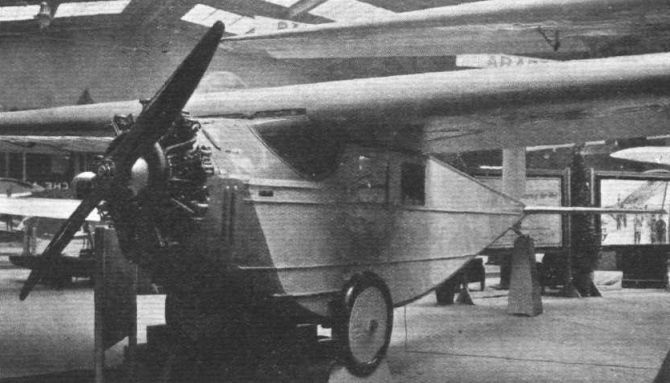 commercial monoplanes, a large 10-seater (the M.20) and a smaller four-seater. M.18c - вариант M.18, доработанный для проведения аэрофотосъемки. M.18d являлся несколько увеличенным вариантом стандартного M.18 с кабиной, рассчитанной на шесть или семь пассажиров. Построили всего восемь самолетов, в том числе и один с поплавковым шасси. The B.F.W. 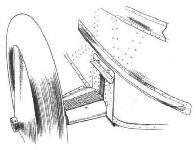 M18 has its wheel axle projecting out through the side of the fuselage, the axle fairing serving to form a step, as shown in this sketch. 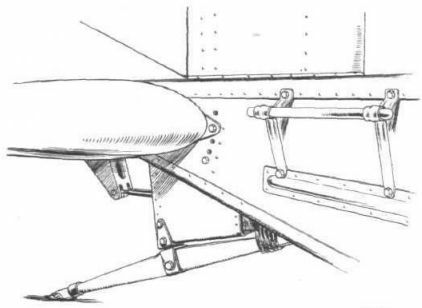 Sketch showing tail skid, central elevator crank and handling rail on the B.F.W. M.18.